You've found it! 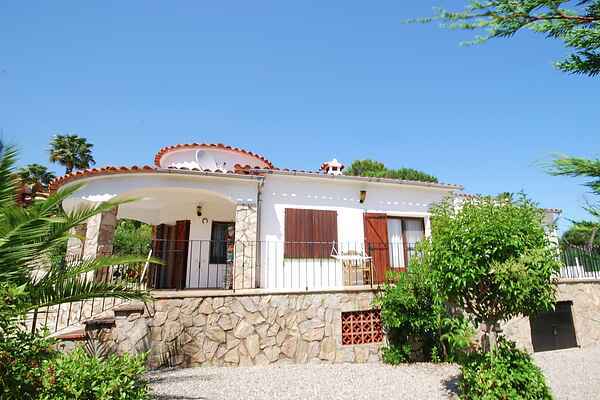 This detached villa in the Mas Pere district of Calonge is the perfect base for your ideal holiday. Around your private swimming pool, you'll find a sundeck with sun loungers. Prefer to relax in the shade? Move your seat over to one of the shady areas. Whatever you enjoy, you'll be doing it among hibiscus, oleander, cacti, palm trees, and beautiful ornamental grass. Let the fun begin! Your sun lounger offers you a fantastic view of the surrounding greenery, and towns like Palamós and Sant Antoni de Calonge, and, of course, the azure blue of the Mediterranean. The nearest restaurant is just 900m from your villa complex. Calonge (3 km) is worthy of several visits. This typical Catalan village has a lovely, rustic center. A market takes place every week. You'll also find a bank and a supermarket there. There's a lot to explore in the stunning, hilly surroundings. Like more Catalan villages and gorgeous bays. Les Gavarres, a breathtaking nature reserve full of walking and biking paths, should also be on your agenda. Hit the sandy beach of Sant Antoni de Calonge, just 6km away. Whether you love beachside strolls or water sports, you can always take a break with a cool drink at an outdoor cafe or on the boulevard.